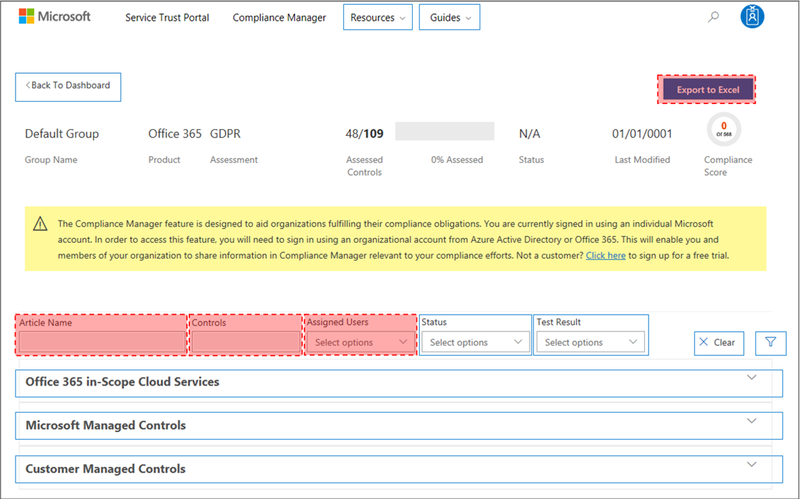 Compliance Manager, a workflow-based risk assessment tool in the Microsoft Service Trust Portal, enables you to track, assign, and verify your organization’s regulatory compliance activities related to Microsoft cloud services, such as Microsoft Office 365, Microsoft Dynamics 365, and Microsoft Azure. It gives the ability to track activities regarding NIST, ISO or GDPR and is helpful to start working on these topics. The main benefit is, that you can not only track your activities, also Microsoft is publishing their results including confidence through third parties. At the end the users without a role will still be able to access the service trust portal but will only see the information provided by Microsoft as you can see on the screenshot from docs.microsoft.com bellow. Red areas are inaccessible for users without a role assigned. To change from default permissions to the role-based access control model, at least one user must be added to each Compliance Manager role (see the following instructions). Important is also, that you cannot assign the permissions to an Azure AD group. You have to specify single users. Select each role from the dropdown and specify dedicated user accounts from your directory. Now only the defined people have access to the confidential information. I hope this blogs helps you to secure your environment. If you have any feedback, don’t hesitate to contact me.